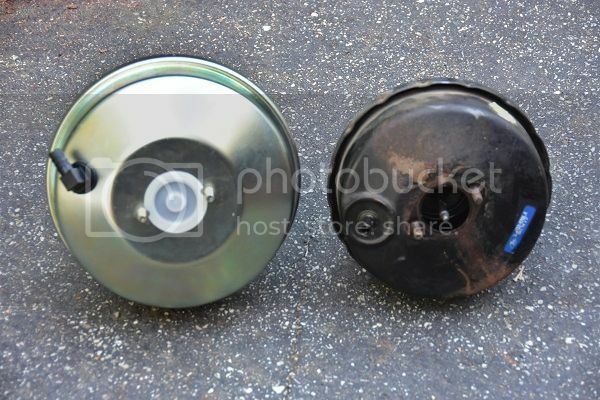 Power Brake Booster Replacement - THE PORTAL HUB - Pinzgauers, Haflingers, Volvo 303s and more! It finally dawned on me that the brake pedal pressure in my 712W was much higher than my 710M (two to three times higher pressure needed). Granted, the W weights almost double what the M weighs, but still... so I decided to replace the brake booster, hose, and check valve. There are two general methods to do this: 1) remove the pedal box from the truck so there is enough room to get it apart, or 2) remove the master cylinder. I elected to remove the master cylinder. FYI, I have a left hand drive so "passenger" and "driver" sides reflect my truck. 1. Disconnect the brake lines. If everything has been resting for a while, very little fluid escapes. 2. Removing the drivers side check valve will make getting the master out a bit easier. 3. Disconnect the brake switch connections and the low fluid switch connections from the front side of the cylinder. These can be removed a bit more easily with the cylinder partially out. 4. Remove the master cylinder (two nuts, front and rear) and puzzle out how to get it clear of the door frame. It will come out, but it is a puzzle! 5. Remove the clutch master cylinder from the pedal box (two nuts, left and right) and gently pull it out from the box; there is no need to disconnect the clutch hydraulic line. 6. There are four nuts to be removed from the brake booster. The top rear, bottom rear, and bottom front are easily seen and removed, but the top front nut is hidden inside the pedal box. I used a 13mm socket on a 1/4" drive ratchet through the clutch master opening to reach it. A narrow angle ratchet is VERY helpful here. 7. 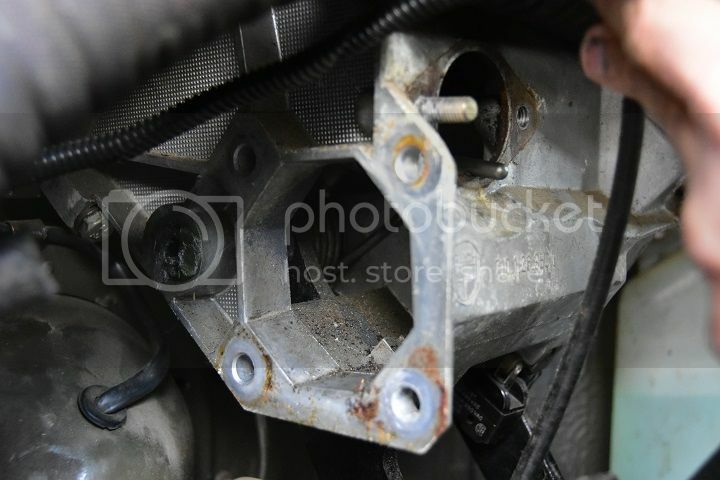 Remove the brake linkage pin on the passenger side of the pedal box. 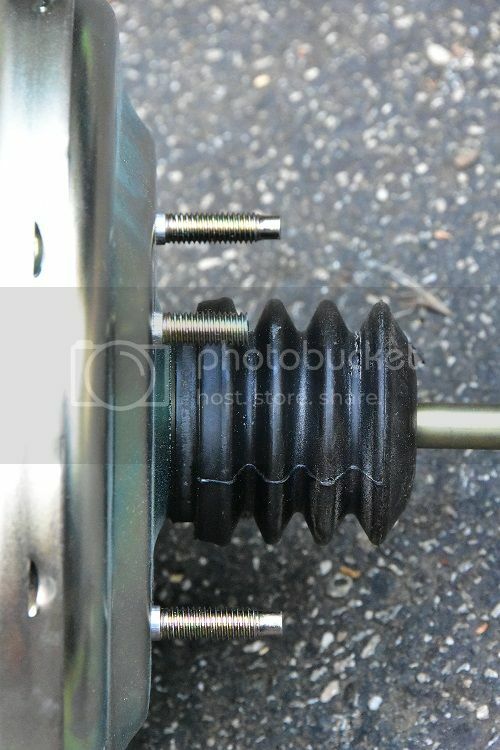 Looking up under the box, gently push the brake pedal and you will see what this is. 8. Slide the booster out the drivers side. You can see the four square pattern booster stud holes, with the one that needs to be reached from inside the clutch master opening in the shadows in the upper left. Knowing that it is on the same level as the top rear hole will help you to find it. 9. Test fit the booster in the pedal box to check the alignment of the brake linkage and adjust the length if necessary. The manual says to allow about 1mm of overtravel of the pedal to ensure that the booster operates correctly (you should have to press the pedal just a bit to get the linkage pin installed). Install the vacuum hose to the booster. 10. Install the booster nuts, tighten, replace the clutch master cylinder, reinstall the brake master cylinder (remember to connect the wires BEFORE it is completely in place! ), connect the brake lines and check valve. Test Drive! My pedal pressure dropped by about 1/3rd of what I had before. Now I have to get used to a much more responsive pedal! There is an excerpt from a german manual which says the 6x6 ues a smaller vacuum booster - 7 inch versus 8 inch. Jim, do you have these pics as well? Yes, I'll get this posting updated but it may be a couple of weeks as I am traveling soon. You gotta be tough if your gonna be stupid. I was able to grab these images from the interwebs... If they are acceptable, can an admin update the original?